Modern businesses need new kinds of applications — ones that are smarter, faster, and can scale more quickly and cost-effectively to accommodate larger data sets, greater workloads, and more users. 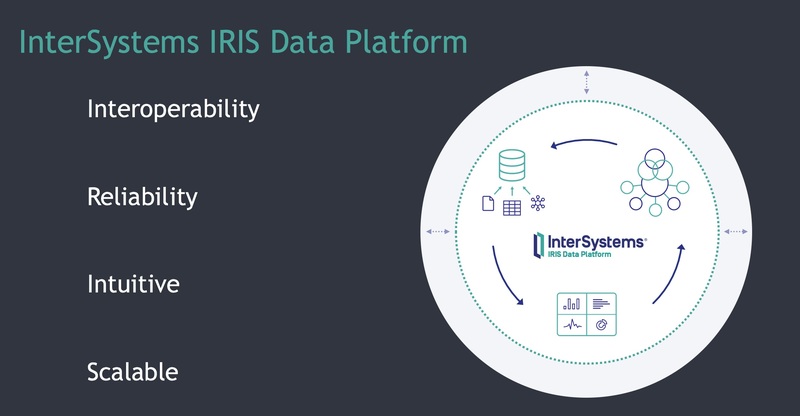 With this in mind, we have unveiled InterSystems IRIS Data Platform™, a complete, unified solution that provides a comprehensive and consistent set of capabilities spanning data management, interoperability, transaction processing, and analytics. It redefines high performance for application developers, systems integrators, and end-user organizations who develop and deploy data-rich and mission-critical solutions. An ultra-high performance, horizontally scalable, multi-model database stores and accesses data modeled as objects, schema-free data, relational data, and multi-dimensional arrays in a single, highly efficient representation. It simultaneously processes both transactional and analytic workloads in a single database at very high scale, eliminating latencies between event, insight, and action, and reducing the complexities associated with maintaining multiple databases. A comprehensive integration platform provides application integration, data coordination, business process orchestration, composite application development, API management, and real-time monitoring and alerting capabilities to support the full spectrum of integration scenarios and requirements. A powerful open analytics platform supports a wide range of analytics, including business intelligence, predictive analytics, distributed big data processing, real-time analytics, and machine learning. It is able to analyze real-time and batch data simultaneously at scale, and developers can embed analytic processing into business processes and transactional applications, enabling sophisticated programmatic decisions based on real-time analyses. The analytics platform also provides natural language processing capabilities to extract meaning and sentiment from unstructured text, allowing organizations to streamline processes that reference customer emails, knowledge databases, social media content, and other unstructured text data. Automated “cloud-first” deployment options simplify public cloud, private cloud, on-premise, and virtual machine deployments and updates. Director of Development, Data Platforms and TrakCare. Hi , Did we have iris cube like cache and ensemble or iris is different. please explain me how to work with iris i am really confused about iris. Here is a lot of information on Intersystems IRIS to reduce confusion. Your InterSystems sales rep will have more.